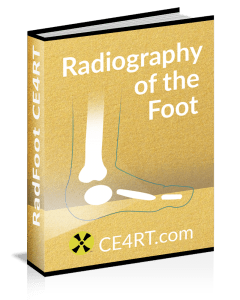 This article discusses radiographic positioning of the abdomen for the Radiologic Technologist (X-Ray Tech). 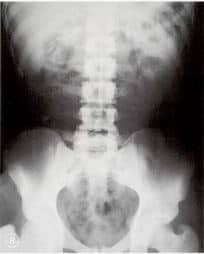 Radiologists consider an abdomen X-ray to be of good quality when the entire abdomen is visible from the diaphragm superiorly to the pelvis inferiorly. 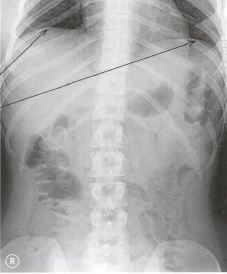 A systematic approach to the interpretation of abdominal X-rays is described by the mnemonic BBC for bowel and other organs (liver, gallbladder, stomach, kidneys, spleen, bladder), bones, and calcifications and artifacts. Purpose and Structures Shown To get a clear image of the abdominal cavity and organs. 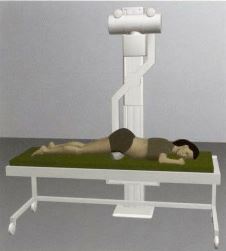 Position of patient Supine with a pillow under the head and centered. The patient should be asked to breathe OUT and hold the breath while the exposure is taken. Position of part The diaphragm should be seen on the image – otherwise, the centering should be adjusted and another film should be obtained. 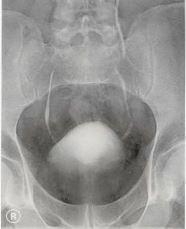 If the pubic symphysis is not visible, a urinary bladder view should be obtained. 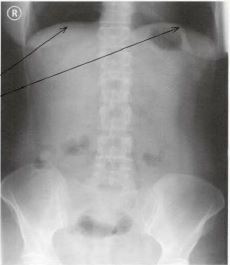 Purpose and Structures Shown To demonstrate the abdominal cavity in a patient diagnosed with gut perforation, intestinal obstruction, or other types of acute abdomen in patients who are ambulatory. 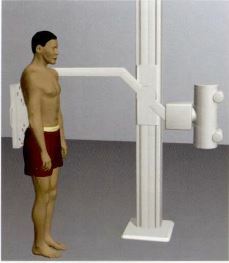 Position of patient Standing erect with the abdomen pressed against the cassette holder. The patient should be asked to stop breathing while the exposure is taken. Position of part The diaphragm should be seen on the image – otherwise, the centering should be adjusted and another film should be obtained. 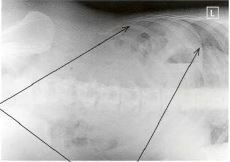 Purpose and Structures Shown To demonstrate the abdominal cavity in a patient diagnosed with gut perforation, intestinal obstruction, or other types of acute abdomen in patients who are NOT ambulatory. 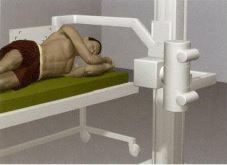 Position of patient Lying on the left side and then the right side (two views have to be taken). The patient should be positioned against the cassette holder and centered. The patient should be asked to breathe OUT and hold the breath while the exposure is taken. 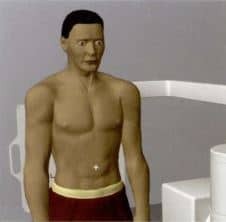 The patient should then be turned over and the other side imaged. 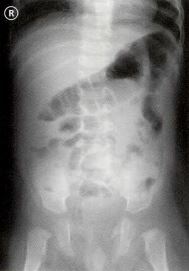 Position of part The upper abdomen should be visible at the top of the films. 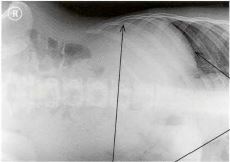 The upper part of the diaphgram must also be seen. 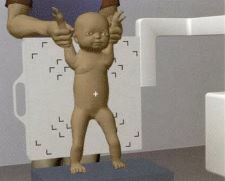 Purpose and Structures Shown To demonstrate the abdominal cavity in infants and small children weighing up to 15 kg. 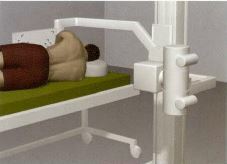 Position of patient Erect, held by the upper arms, with feet supported by a stool if possible, and back resting against the cassette holder. The exposure should be taken when the infant is not moving. The person holding the infant must always wear a lead apron, and when possible, lead gloves. Position of part Centered to the navel. 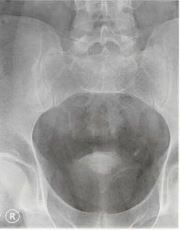 Purpose and Structures Shown To evaluate the urinary tract and pelvis. 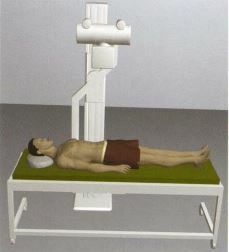 Position of patient Supine with a pillow under the head and centered on the table. The patient should be asked to breathe OUT and hold the breath while the exposure is taken. 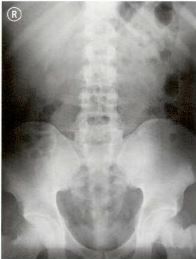 Position of part The lower ribs and the top of the kidneys must be seen – if not, center again and take another exposure. 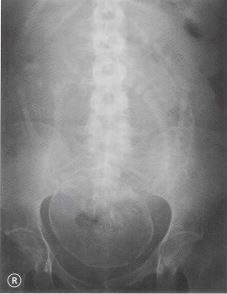 If the pubic symphysis is not seen, obtain a urinary bladder view. Purpose and Structures Shown A view of the urinary bladder and pelvis with a vertical beam angled at 20 degrees. 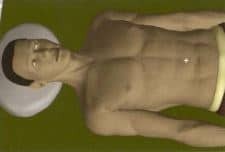 Position of patient Supine with a pillow under the head and centered 4 cm above the pubic symphysis. The patient should be asked to hold the breath while the exposure is taken. 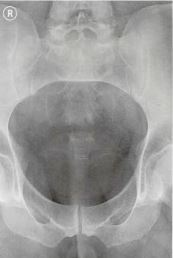 Position of part The bladder should be visible. Purpose and Structures Shown Examination of the kidneys, ureter, and bladder with intravenous contrast medium. 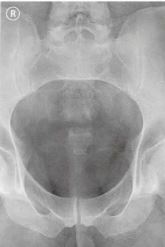 Position of part The patient should be asked to empty the bladder. A urinary tract exposure should first be taken (film 1). 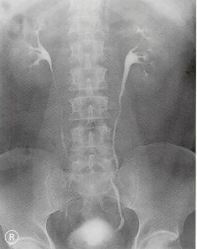 If the bladder is not visible, then a urinary bladder and pelvis view should be obtained (film 1A). 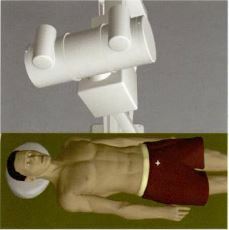 The films are reviewed by the radiologist and contrast is administered. The time of contrast injection must be noted. A urinary tract exposure must be taken immediately after contrast injection (film 2) and then 10 minutes after contrast injection (film 3). 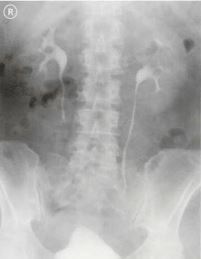 If the films 2 and 3 are satisfactory, a urinary bladder and pelvis view is obtained with the bladder full (film 4) and after urinating and emptying the bladder (film 4A). 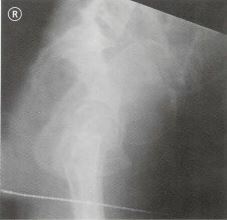 If the films are NOT satisfactory, a prone abdomen view is obtained 15 minutes after film 3 (or 25 minutes after contrast injection). 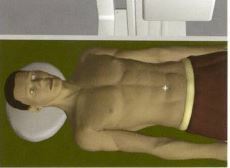 The patient is then turned back to supine position. Purpose and Structures Shown This view is taken when cephalopelvic disproportion (obstructed labor) is suspected. It is NOT taken before the 37th week of pregnancy. 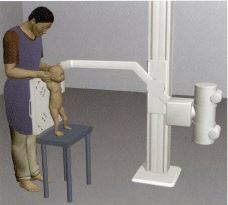 This examination is used only if ultrasound is not available. 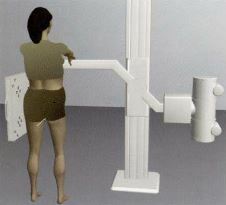 Position of patient Standing erect. The patient should be asked to empty her bladder. The left side is positioned against the cassette holder. 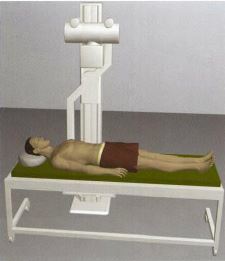 A measuring rod is placed between the legs. The patient should be asked to stop breathing while the exposure is taken. 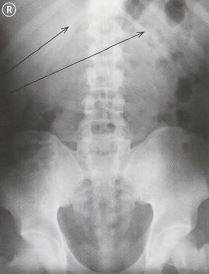 Position of part The symphysis and measuring rod should be visible on the film. 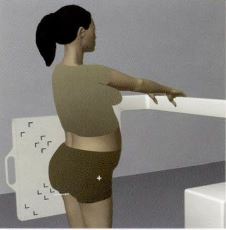 Position of patient Prone with support under the pelvis. The patient should be asked to empty her bladder. If it is impossible for the patient to lie prone, she can be positioned supine. The patient should be asked to stop breathing while the exposure is taken. 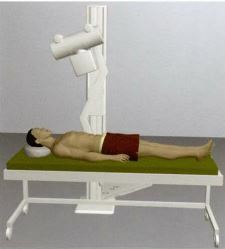 Position of part Centered with the left and right markers in correct place with the patient prone.